Do your teeth seem longer than they used to be? Have your teeth become more sensitive to cold drinks? These are a couple of common signs that are associated with a condition called gum recession. Gum recession tends to be more prevalent in older patients, but it can occur at any age due to oral hygiene habits, lifestyle choices, and other factors. When the gums recede, the gum pockets are more susceptible to collecting bacteria, resulting in a heightened risk of developing infections. Because having uneven pressure in the chewing system is one of the leading causes of gum recession, it is crucial to go to a dentist that is qualified to study how the bite comes together to maintain optimal dental health. Dr. Chad Tomazin has a biological dental office and focuses on comprehensive oral health. Periodontal (Gum) Disease: Although it is true that our risk of developing periodontal disease increases as we age, it is the bacteria in the mouth that cause gum infections. These bacteria grow and multiply between dental cleanings and live under the gum tissue where dental floss goes. Unhealthy Diet: Vitamin C, Vitamin B12, and essential fatty acids all play a critical role in gum health. Consuming a diet that contains plenty of fruits and vegetables will help to keep the tissue healthy. Conversely, eating unhealthy foods that contain excess amounts of sugar or starch can contribute to gum recession as well as other dental issues. Bite Imbalance, Clenching, and Grinding: Millions of patients suffer from continual gum recession that could be treated with proper bite balancing. When the bite is uneven, there is also uneven pressure on the teeth, causing tissue and bone destruction in those areas. Clenching and grinding also put excessive force on the teeth, damaging the surrounding bone and gum tissue. Chewing Tobacco: Patients who chew tobacco place the product against the gums, which suffocates the gum tissue in that area. Additionally, chewing tobacco increases the risk of oral cancer and other serious conditions. Oral Piercings: Wearing lip and tongue piercings can cause trauma to adjacent tissue inside the mouth and cause the gums to recede. Sodium Lauryl Sulfate Intolerance: Individuals who are sensitive to this toothpaste additive can experience gum recession due to irritation. 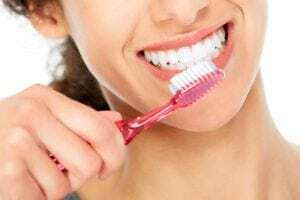 Use a soft-bristled toothbrush to avoid “brushing away” the gums. Floss between all of your teeth at least once a day. Maintain a regular oral hygiene schedule with your dental hygienist to minimize the amount of bacteria in your gums and teeth. Have your bite thoroughly evaluated by your dentist. Prevent destruction of gum tissue by correcting the bite with orthodontics. Wearing a night guard while you sleep reduces the amount of stress on the jaw joint and teeth. Consume a balanced diet rich with Vitamin C, Vitamin D, and B vitamins. Take time to decompress and relax the body. Stress plays a significant role in breaking down the immune system, which starves gum tissue of the nutrients and oxygen it needs. Bacterial Infection Treatment: Removing the plaque and tartar along with killing the bacteria present surrounding the gum tissue is ideal. Dr. Tomazin offers advanced ozone periodontal therapy programs that disinfect the gum tissue. Periodontal deep cleanings can also help prevent further infection by removing plaque, tartar, and biofilm on the surface of the teeth. At-Home Dental Hygiene Recommendations: Investing in an electric toothbrush and dental irrigator will help remove plaque and debris. These will also disrupt the bacterial colonies surrounding the teeth and gum tissue. Flossing also helps to disrupt bacteria and remove plaque. Bite Analysis: Visible wear on the teeth, such as flattening of the teeth or notches on the sides of the teeth, are indications that the bite is imbalanced. A professional bite study can prevent further destruction of the teeth and gums. Orthodontics: This type of dental therapy can correct a poor bite. Experienced orthodontists are capable of moving adult teeth slowly enough to avoid damaging the bone and gum tissue. Tissue Repositioning: This is a surgical procedure that is performed by a periodontist (gum specialist) to preserve the health of the tooth. When the root is exposed, it is more susceptible to tooth decay and sensitivity. Tissue repositioning involves lifting the gum tissue and repositioning it to cover the exposed root surface. Sutures are placed to secure the tissue, and the area usually takes between two and four weeks to heal. Tissue Grafting: A periodontist also performs this procedure. When there is insufficient gum tissue, a tissue graft is placed on the receded area. A collagen graft or tissue from the roof of the mouth can be used during treatment. Again, sutures are used, and the grafted area typically heals in two to four weeks. If you suspect your gums have receded, please contact the office of Dr. Chad Tomazin by calling 951.686.3666.